I have found in life that if I do not take the time to fill up on self-love that I have a hard time being kind and loving toward others. If we think of ourselves as unworthy, other people will also think of us as unworthy. When we are miserable and do not take the time to love ourselves, we unconsciously send a message to others that we don’t want to be loved. This is something that I struggled with for a long time. I never liked myself, therefore I never said anything nice about myself or my body and I certainly never took care of my health. As a result, I was miserable, I never felt lovable and I had a hard time showing compassion towards or loving others. Negativity attracts negativity, it is as simple as that. 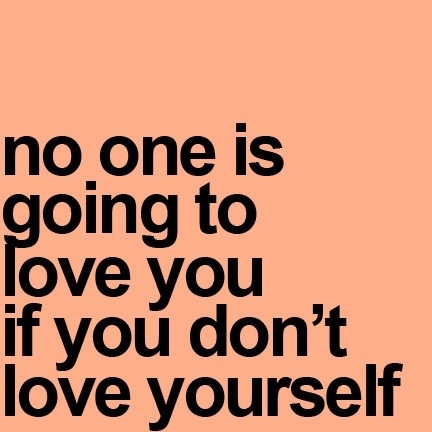 No one is going to love you, if you don’t love yourself. Remember to take some time everyday to fill up on self-love, by doing something that you enjoy. For me, that time is when I do yoga. It is a great way to love and show appreciation for my body, by breathing and stretching and really being with myself and finding out who I am. I try to take 1 hour of “me” time away from the family to practice yoga or even just to read or write a blog a few times a week and when I do, I come back a better mother and wife. I used to worry that taking any time to myself was selfish, but then I realized that not taking care of myself was even more selfish. When I take the time to take care of my health, physically, mentally and spiritually, I become a happier, more peaceful and more loving person. Remember – SELF-LOVE IS NOT SELFISH! Beautiful and inspiring post my friend!! I am loving this topic right now and have loved being on my self love journey! you learn so much from yourself don’t you?? Its true that you can’t show love to others if you can’t show it to yourself.